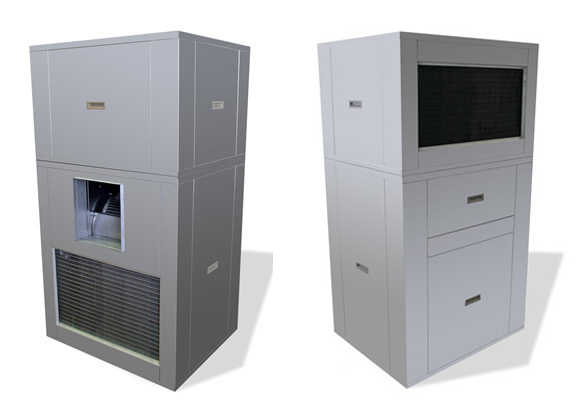 Spinnaker Industries Inc. “SPVAC” vertical self-contained air conditioning packages offer a complete line of unit options for indoor, through-the-wall installation for high rise and single story building applications. Spinnaker Industries Inc. compact, indoor design protects against potential vandalism, weathering and eliminates the need for any unsightly exterior equipment. Floor-by-floor installation provides independent zone and temperature control, eliminating many of the complications encountered with roof-top equipment. Renovation and restoration projects are simplified where roof load, cooling tower, and construction restrictions can present application problems. Spinnaker’s SPVAC Air Cooled Indoor Vertical air conditioning design offers a high efficiency, quality engineered, quiet and dependable option to conventional rooftop equipment. The SPVAC has been designed to provide a solid answer for “NICHE” engineering requirements.